Tennis courts need regular maintenance if they want to be kept clean, and you want them to be in top condition for every match. Keeping a tennis court clean isn’t as difficult as you may think. And while it’s a good idea to hire a professional to perform a deeper clean, there are some things that you can do on your own. If you use the right methods, you’ll be able to create a better playing experience. And your court will last longer. The steps that you should take for cleaning your tennis court will depend on what its surface is made of. You can use a tennis court sweeper to remove any dirt, dust, or debris before and after every match. And you can use a rubber mop or foam roller to get rid of rainwater. Even with these basic methods, there are minor issues that can turn into major problems if they’re not taken care of. And there are some steps that you can take to fix them. You can remove stains with a solution that’s made of mild soap and water. And if that doesn’t work, you can use a special kind of stain remover that’s made for tennis courts. 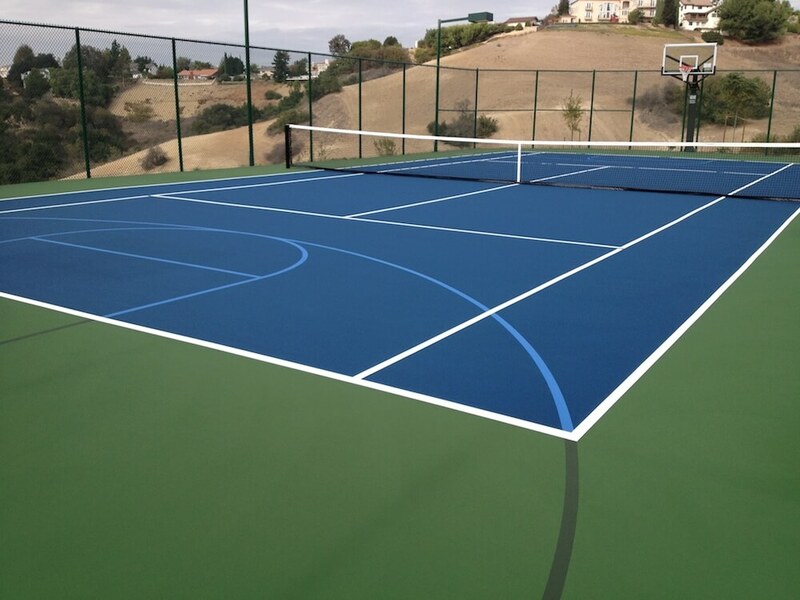 You can damage your court if you use the wrong kind of product, which is why you should hire a professional if the stain doesn’t come off after the first try. And you should never try to hide the stain with a new coat of paint, because it will look darker on that particular spot. You should check your tennis court for cracks, because even a thin line that’s barely visible can shorten its lifespan. Tennis court cracks aren’t an emergency, but they should be taken care of. Larger cracks should be looked at by a professional. But if they’re smaller, you can use a pre-mixed filler that you can apply without professional help. Even if you remove dirt, dust, and debris with a tennis court sweeper, it can get scratched from regular use. Players should wear tennis shoes, because they’re made specifically for tennis courts. You should never wear spiked shoes, skates, high heels, or anything similar because they’ll scratch the surface. And you should never drag heavy equipment across the surface, because it will do the same thing. Even if you use a tennis court sweeper on a regular basis, you should use a pressure washer because it will extend the amount of time you’ll have until it needs a new coat of paint. And it will act like a polisher that will keep the paint looking like new. However, you should never use a pressure washer if you don’t know how to use it. If you’re not sure, you should hire a professional to do it for you. If you need a quality tennis court sweeper, get in touch with AeroSweep today!